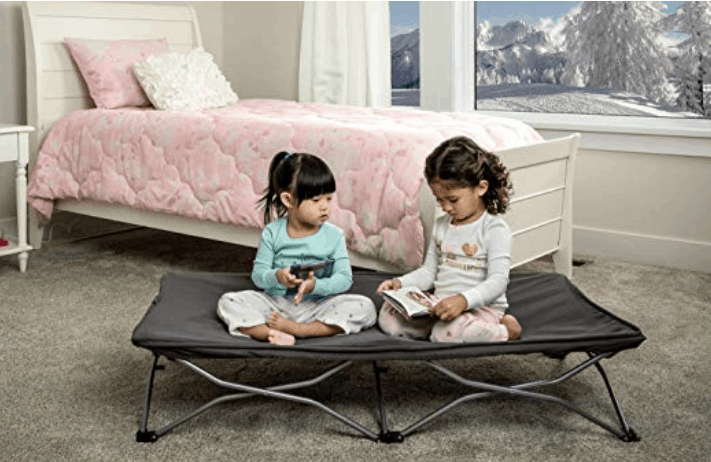 Whether you’re tent camping with a toddler and need an all in one toddler travel bed or are an avid traveler and need a conveneint fold away bed, you’re in the right spot! I know we often end up spending a night or two in a hotel, even if we are using our pull behind, if we are on an extended trip just so that we can shower and catch up on laundry. With my little boy now a 43 pound massive toddler who kicks like a donkey, co sleeping while in hotels isn’t really an option – even more so this season when my twin girls who just don’t sleep well with me! I’ll cover the various sorts of camping beds first, but I’ll also include useful things such as good travel bedrails and such that make exploring on the road so much easier! Helpful addons to make the Shrunks Toddler Travel Bed even more awesome for camping and traveling! How do you camp with a toddler? 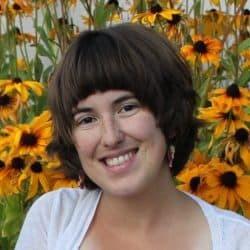 How do I get my toddler to sleep while camping? Can a toddle sleep on an air mattress? 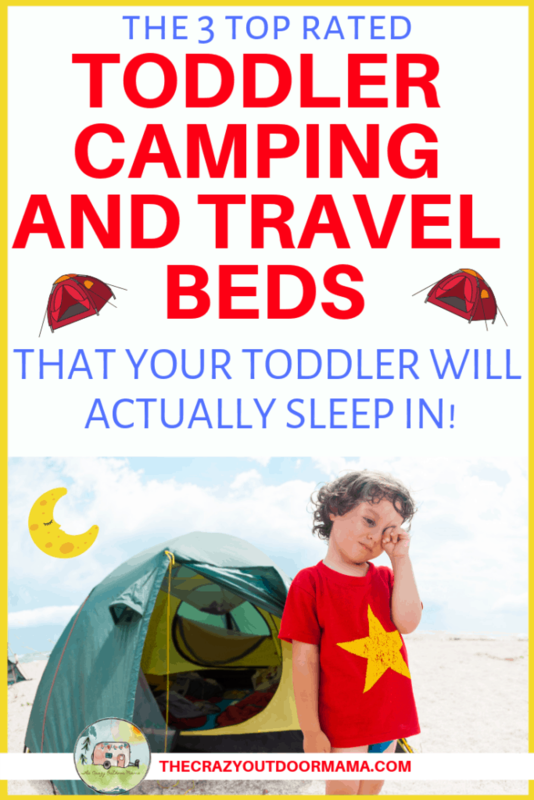 Now that you know the best toddler travel bed, go on some awesome camping adventures! I am going to assume that you are tent camping, and are looking for a safe, portable sleep option for your toddler in your tent. P.S. If you are RV camping with your toddler, there’s a pretty quick fix to make a safe sleep area in your camper bunk for him! Related: Don’t forget to get your toddler their own camp chair for fuss free camping! 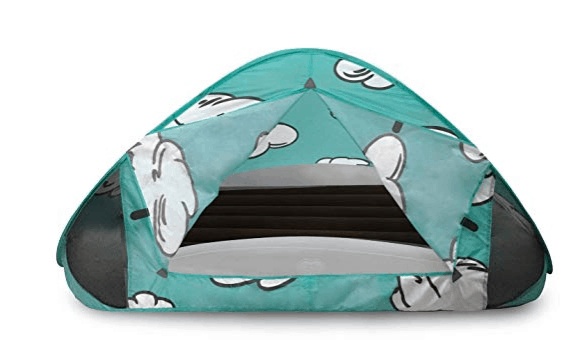 I have given an overview of the top 3 toddler camping beds below – keep scrolling though for a more in depth review of each! 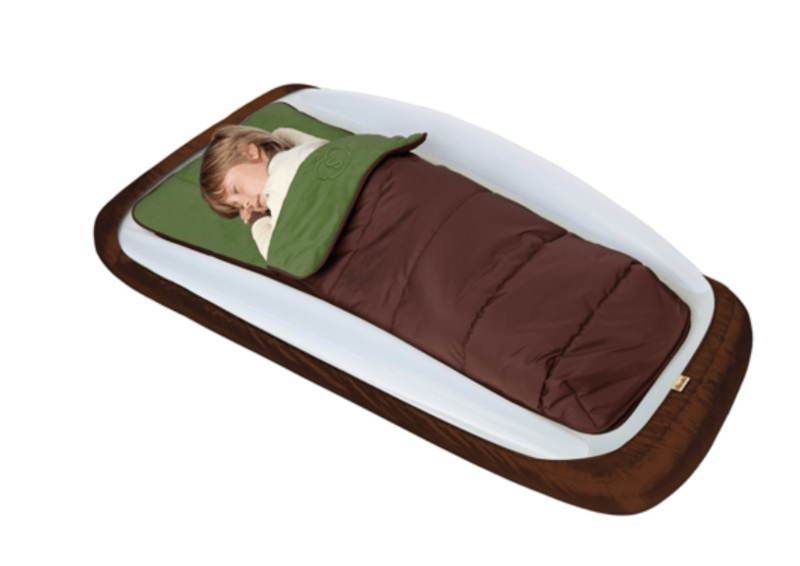 This is by and far the best selection for both a camping toddler bed and for travel! I love that this bed can fit standard crib sheets, making it super easy to swap out after accidents while camping or traveling (which seem to happen way more often since they are in a new exciting place). Related: Find out how to camp with a toddler here (from planning to packing up!) 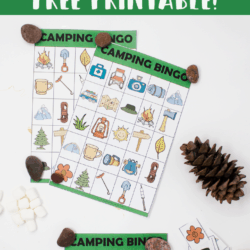 and how to keep your toddler busy at the campground! Another great feature of this toddler air mattres is that it has built in bed rails that are soft and decently high so that it’s not quite as easy to roll out! Normal kid travel beds don’t have this and normally you have to buy it seperately! Here’s a recap of why the Shrunks Toddler Travel Bed is the best choice for camping and traveling! Small size for easy packing – It is only 16″ wide and 7″ tall when rolled up! Sheet tuck feature – the top part of the bed allows you to tuck in standard size crib sheets, as well as blankets to keep them all in place on cold camping nights (no more kicking them off!) It also makes it super easy to keep clean! Toddler size air mattress with sides – Most air mattresses are built for big kids or adults, but this one is actually toddler size, and comes with the sides built in so you don’t need to buy or pack more stuff! Inflates in 30 seconds – They include a pump specifically for this bed that can safely and quickly get the job done! Voted the best toddler travel bed 7 years in a row, the Shrunks Toddler Travel Bed is EVERYTHING you want – light, packs small, fits a crib sheet, and comes with built in bumpers! I absolutely love that they sell different additions to modify the bed how you want, depending on it’s use! My two favorite though were the tent canopy and the sleeping bag that is super warm and a perfect fit! Here they are below! This isn’t just a cheapy K-mart bag, or a gimmic add on item – it is actually a really cozy, fleece interior sleeping bag! What’s awesome is that the sleeping bag attaches to the Shrunks bed, and it even has a top zipper should your toddler not like the confinement! Here’s why you’ll love the sleeping bag accessory as much as me for the Shrunks! SUPER warm – It has your typical sleeping bag outer material, but inside is super warm and comfy fleece! Can be used separately – Yes, should your little guy love it so much he wants to use it at home, it is completely functional by itself as a normal sleeping bag! This cozy attachable sleeping bag is the perfect accessory for your Shrunks bed – warm and cozy while easy to use and wash! This one isn’t going to be as important, but it could be a lifesaver if you have distracted sleepers! I love that this tent blocks out what’s going on to make it easier for yout toddler go to sleep. I love that, if camping with this Shrunks set up, you could even drape a blanket over it to really darken the inside since days are soooo long during summer, and all the extra light can make it hard to sleep! Especially if your toddler is used to a darkened room at home! Here’s some quick scenarios where this tent for the Shrunks bed might be ideal for you! Darkening for sleep – Your toddler has a hard time falling asleep while it’s light out (like when camping when it doesn’t get dark till 9 or 10 at night!) and is used to a darkened room at home. Distracted sleeper in the hotel (or tent!) – No more pretending you’re asleep till your toddler falls asleep in the hotel room (and accidentally falling asleep yourself!) just pop up this tent to block out distractions, allowing yourself to still go about your business while your toddler drifts away! 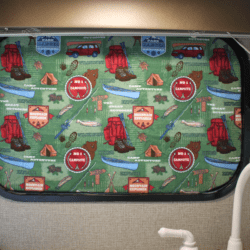 I love that this fits on top of the Shrunks bed and can provide a darkened and distraction free sleep environment for toddlers while camping and traveling! I wouldn’t say that this is inferior to the Shrunks Bed, but maybe not as ideal for camping just because it doesn’t have all the attachments like the sleeping bag and tent. If you are concerned about holes in the inflattable toddler travel mattresses or the possible sounds, then this is the bed for you! Easy fold up toddler bed – This bed just folds up for storage, and folds down for use! Can store all of toddler’s bedtime stuff INSIDE – Since it just folds up and is a box shape, tht means there is a big gap inside! This is perfect for keeping toddler sleep stuff organized such as PJs, blankies and favorite stuffed animals! I love how easy the this portable toddler bed is to set up – just fold it down! It also can store all of your toddlers must have bed items so you don’t forget or lose them! This cot will get the job done – it is lightweight, folds down small and sets up easy. It’s made of an all steel frame and is unlikely to have any issues. However my concern is the lack of bed rails and the tipping ability. If your toddler is anything like mine, he is easily excitable in new places and might jump out of bed or roll around! This cot does tip over if weight is shifted, and it’s so minimal that it would make it hard to use bed rails of any kind. This might not be an issue if you have an older toddler, or just want to save some money (it’s much cheaper than the first two options). Easy set up – Simply fold and unfold it like a camping chair! Potential Concern of tipping and bed rail set up – Reviewers mentioned that this cot tips if weight is shifted to one side fairly easy, and since it’s so minimal it doesn’t really have a spot for bed rails. This might be best for older toddlers that don’t have this risk! Includes fitted sheet – This makes for easy leaning and upkeep! Thrify! – This is the cheapest option, so if you’re on a budget or don’t plan on using it often, it may be the best choice. 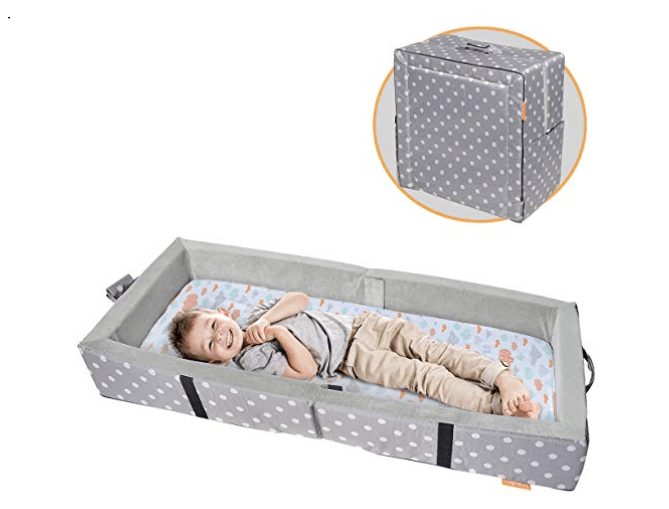 While this cot style toddler bed may have been what comes to mind for camping (portable, lightweight, etc) it is best for older toddlers who need minimum sleep safety additions like bed rails or reducing tipping possibilities! A simple solution if you already have a typical bed rail at home would be to just use it in your bunk bed in your camper – it does make getting in and out not possible, but it’s nice knowing your toddlerwon’t be wandering at night! However if you are looking for a true travel bed rail for your toddler that packs small and is easy to use, you’ll want something a little less clunky than those massive bed rails! Foam bed rails are best as they fit every bed (usually go under fitted sheet), are soft, and retain their form even after being squished and folded down! These bed rails have unique shape that prevent slipping, as well as being soft enough that they won’t injure your toddler should they roll into them! I also love that it comes with it’s own travel bag, making it compact and easy to pack. There are inflatable bed rails, but they don’t seem to really bed THAT much smaller and some people complained about slow leaks and difficulties returning them! Compact Foam – Foam is soft enough ton ot hurt little heads, firm enough to stop rolling, but also rolls super small and compact in it’s own travel bag! Unique design prevents rolling – Alot of other foam bed rails have a semi circle shape, but these ones have a peak shape that stop even the wigliest toddlers from rolling over these travel bed rails! Easy for awake child to climb out of – While typical gate style bed rails are tall and cumbersome, making it hard or an awake child to get out of bed, these foam bed rails are high enough for a sleeping child (4 1/2 inches tall!) but low enough to still allow access out should they be awake! The Bed Buddy Bed rails are the best toddler travel bed rails out there because they are made of foam which means they store super small, are durable, and retain their shape. There are tons of questions that people have – toddler sleep while at HOME is a hot topic after all! Here are some common questions about toddler sleep, and how to get the most out of your camping trip! Pick an “easy” campground – That means one with the least amount of potential dangers so that there are less “nos”, helicoptering, and more fun! That means a safe distance from water (even though camping right on the river or lake sounds amazing), preferrably off the road a bit, and without too many hazards like sharp rocks or harmful plants. You don’t need alot of toys – You could repurpose things you are already bringing like pots, spoons cups etc if you are conerned with space. Most people only camp for a weekend at a time, and most toddlers will find PLENTY to do outside with just rocks and sticks! Have appropriate expectations – If you camped before your toddler, then go into this knowing things may take longer to do, daytime exploring may be shorter, and chores may get more complicated (and you may not be lounging in a camp chair for 3 hours straight) However, it is completely worth it! Wear them out – Sleeping in a new place is hard, but if you’re completely exhausted, you’re much less likely to care where you’re sleeping! Expect later nights – Summer days are long, and it’s hard to calm down from the excitement of camping. Just go into this with that expectation, and you’ll find you aren’t near as focused (or dissapointed) by your toddler’s bed time! Since my top reccommendations for a toddler camping bed is an air mattress of sorts, it’s important to address this question! While I could not find ANY study on toddlers safety with air mattresss, it is definitely not recommended for babies under one to sleep on them due to suffocation hazards that come with immaturity. I am not a doctor, but most toddlers can likely correct themselves should they get stuck in a spot where they couldn’t breathe. The Shrunks toddler travel bed has a page about their safety verification and testing process here in case you were interested! Sleep is SERIOUSLY important to a camp or travel vacation being enjoyable, and if your kids dont sleep no one sleeps! Great article, lots of helpful information on kids camping beds.